Gaston is an internet sensation in Disney Parks. He is hilarious. You can catch his act on You Tube but we had some fun with him our last trip. "BELLE! I'm going to MARRY her!" He tells the girl to touch the sleeve of his shirt. "Do you know what this IS?" he booms in a deep authoritative voice. She timidly shakes her head "no." "It's MARRIAGE MATERIAL! Now you tell her about it!" My friend's little girl is next. He has her lift her arms over her head and he puts his arm on top of her hands. "You need two arms to hold this muscle!" he tells her. "Now don't let go! It's very heavy!" "I'm adding a 13th! 'Gastonuary!'" This guy is a scream and anything is fair game. Challenge him to an arm wrestle, a push up contest... or as my friend suggested - Tell him you're a feminist and like books! 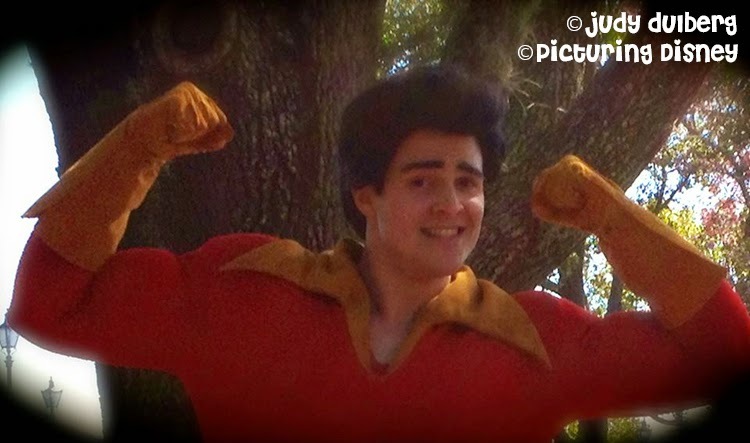 All of the characters are wonderful, but Gaston, he is not to be missed! Make sure to make room in your schedule for him... but don't tell him. It will definitely go to his head!